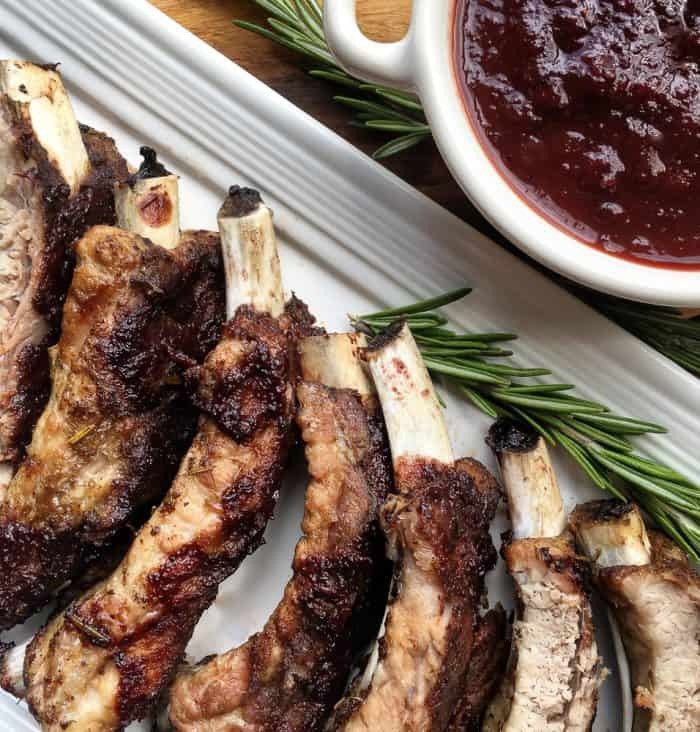 You can make delicious ribs in the Instant Pot thanks to this Instant Pot ribs recipe. Is there anything a pressure cooker can’t do? If only it would clean my house! Until then, I’ll be grateful it helps me get dinner on the table with simple recipes like this one. If you don’t have an Instant Pot pressure cooker, you’ll still love this dry rub for pork ribs. 1. Combine ingredients for the dry rub in a small bowl and stir to combine. Set aside. 2. Carefully remove membrane from back of baby back ribs. It’s easiest to get it started with a sharp knife, then grip the end with a paper towel and pull. Don’t skip this step! It makes the difference between tender ribs and tough ones. 3. Cut the ribs into 3 or 4 equal-sized parts and work the dry rub into each section on both sides. Set aside. 4. Add beef broth or water to Instant Pot and insert the metal rack. Place the seasoned ribs on their sides on top of the insert. (Do not stack them flat on top of each other). 5. Lock the Instant Pot lid into place and flip the pressure valve to “Sealing.” Set the “Manual” setting to high for 30 minutes. 6. Meanwhile, line a large, rimmed baking sheet with aluminum foil and set aside. 7. Once cooking time is complete, do a quick release by flipping the sealing valve to the “Venting” position. Unlock and remove the Instant Pot lid and carefully transfer ribs to prepared baking sheet. Brush ribs with a generous amount of BBQ sauce on each side. 8. Pre-heat broiler to high and broil the ribs for 3-5 minutes or until the BBQ sauce is caramelized. Remove from oven and cool slightly before cutting into individual portions. Serve immediately with extra BBQ sauce for dipping. 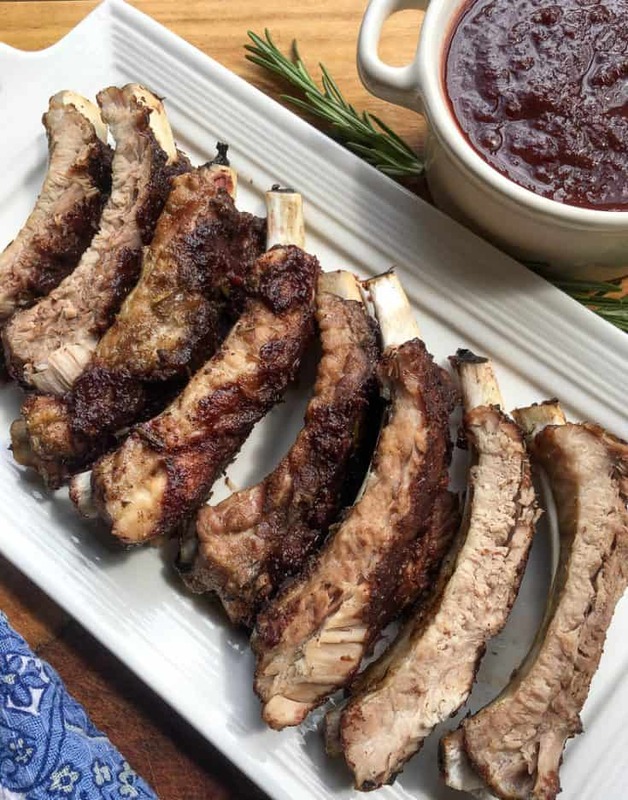 You can make delicious ribs in the Instant Pot thanks to this Instant Pot ribs recipe. No pressure cooker in your kitchen? You'll love the dry rub for pork ribs no matter how you're cooking them up. Carefully remove membrane from back of baby back ribs. It's easiest to get it started with a sharp knife, then grib the end with a paper towel and pull. Cut the ribs into 3 or 4 equal-sized parts and work the dry rub into each section on both sides. Set aside. Once cooking time is complete, do a quick release by flipping the sealing valve to the “Venting” position. Unlock and remove the Instant Pot lid and carefully transfer ribs to prepared baking sheet. Brush ribs with a generous amount of BBQ sauce on each side. Pre-heat broiler to high and broil the ribs for 3-5 minutes or until the BBQ sauce is caramelized. Remove from oven and cool slightly before cutting into individual portions. Serve immediately with extra BBQ sauce for dipping. After you’ve made ribs in the Instant Pot, you might want to try this Instant Pot chicken thigh recipe next!